A violent tornado hit off Venice, in particular the islands of St. Helena, Charterhouse and St. Erasmus, the garden of the lagoon. The Municipal Civil Protection, after an initial survey, reports that there is substantial damage to the island of Certosa with hundreds of trees felled. The restored buildings in recent times does not appear to be damaged. There were 300 hectares of agricultural land destroyed, and damage is estimated at around one million euros. The classification of this tornado on the Fujita scale category is positioned between the F1 and F2. Supercell formed in the Venetia with the almost perfect structure. Influenced by strong currents at high altitude (jet stream) from the west and the call to the ground by warm and humid south generated all ingredients for the event. 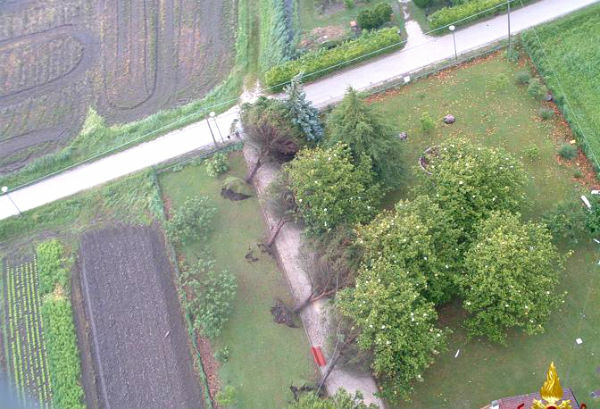 Northern regions of Italy and Croatia experienced bad weather with stormy conditions as well. The flow of Atlantic currents supplanted by the far northern reaches of anticyclone of the Azores influenced weather conditions that led to tornado. The same system will lead to a situation of intense heat that will probably last for a week. 42 years ago, on September 11 1970, a violent tornado sunk hundreds of boats and caused death of 21 people by drowning in the same area. Perhaps strongest European tornado struck Italy on July 24, 1930. It was registered as F5 with gusts of about 500km/h. It leveled masonry buildings in city of Montello in Veneto and Friuli region and left 23 fatalities. Another strong twister struck Parma, Italy on July 4, 1965 with 25 fatalities and 160 injuries.